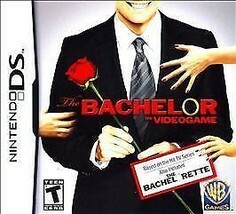 The Bachelor: The Videogame is an interactive home version of the reality TV dating game show. Following the television format, the game is hosted by a virtual Chris Harrison, and features contestants from the real-life ABC network series. In the role of a single young woman seeking a husband, players interact with the game's featured bachelor, both on "group dates" and in one-on-one situations. Players take personality tests to generate a dating profile and gauge their compatibility with the bachelor. They can choose to sabotage the efforts of other contestants in order to get ahead in the competition. The goal is to receive a rose at the end of each chapter, so to be allowed to continue to the final episodes' hometown and family visits, and ultimately to be the one contestant the bachelor chooses for a long-term relationship at the end of the season. The game also features a gender-reversed version that follows the format of The Bachelorette spin-off series, with multiple male contestants vying to be the final choice of a desirable, single young woman.